The Veterinary Medical Center of Long Island (VMCLI) is a 28,000 square foot, state of the art, 24-hour, emergency and multi-specialty referral practice, located in West Islip, Long Island. At the Veterinary Medical Center of Long Island, we know that the connection to your pet lasts a lifetime. Next to you and your family, your veterinarian is one of the most important people in your pet’s life. Our caring approach places emphasis on an efficient and accurate diagnosis, gained by the use of the least invasive techniques permissible. This often requires the expertise of our specialist staff. We are committed to providing cutting-edge veterinary medicine and sharing this knowledge and expertise with both pet owners and referring family veterinarians. 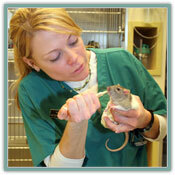 We specialize in critical emergency care and offer a variety of services to meet your pets needs. What makes a Veterinary Specialist a “Specialist”? VMCLI is excited to welcome Dr. Mariana Pardo to our team of veterinarians and critical care department! Dr. Pardo’s clinical interests include intoxications, trauma and sepsis, as well as a large interest in teaching methodologies of veterinary technicians, interns and residents. Her main goals are to provide patients with the best standards of care in a multi-specialty integrative environment. VMCLI is excited to welcome Dr. Sergi Serrano to our team of veterinarians and critical care department! Dr. Serrano has published numerous articles and enjoys lecturing both in the US and abroad. 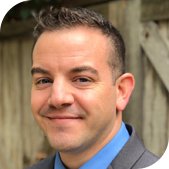 Dr. Serrano’s clinical interests include intoxications, trauma and sepsis, as well as a large interest in teaching methodologies of veterinary technicians, interns and residents. His main goals are to provide patients with the highest standards of care in a multi-specialty integrative environment. VMCLI is excited to welcome Dr. Nicholas Parente to our team of veterinarians and internal medicine department! While Dr. Parente has a wide depth and breadth of experience in all areas of internal medicine, he particularly enjoys helping patients with autoimmune and gastrointestinal conditions. When not working he likes to spend time with his family and spoil his own dog Calli, who hasn’t quite realized she is a dog. Having practiced in New York, the Mid West, and most recently New Orleans, Dr. Parente realized that there is no place like ‘home’ and is excited to join the VMCLI family. VMCLI is excited to welcome Dr. Jacquleine Carver to our team of veterinarians and surgery department! Dr. Carver performs orthopedic, neurological, oncologic, and soft tissue surgery. 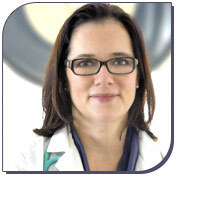 She has advanced training and expertise in laparoscopic and arthroscopic procedures. 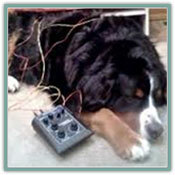 She has a particular aptitude for complex wound management cases, congenital conditions, breed specific conditions (i.e. brachiocephalic breeds), and “exotic” pet surgery. 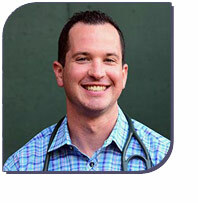 VMCLI is excited to welcome Dr. Josh Morgenstern to our team of veterinarians and cardiology department! Dr. Morgenstern is Board-certified in veterinary cardiology by the American College of Veterinary Internal Medicine. He graduated from St. George’s University before completing an internship at the Animal Medical Center in New York City, a specialty internship in cardiology at Blue Pearl Veterinary Partners in Tampa Florida and a residency in veterinary cardiology at Advanced Veterinary Care Center in Los Angeles. VMCLI is excited to welcome Dr. Rada Panich to our team of veterinarians and Dermatology department! She is the author of professional publications, textbook chapters and has lectured on several areas of veterinary dermatology. The Veterinary Medical Center of Long Island Invites you to attend our annual Practice Excellence. Dr. Daniel Carmichael, DAVDC will be discussing feline Gingivostomotitis & Tooth Resorption and Dr. Sean Hillock, DACVIM will be presenting on Hypoproteinemia. All doctors, technicians and managers are welcome to attend. Please RSVP by 10/15/2016….. Seating is Limited! PLEASE JOIN US FOR THE VMCLI’S FIRST ANNUAL NATIONAL WALK ‘N ROLL DOG DAY Founded in August 2012 by award winning author and advocate for dogs with Intervertebral Disc disease (IVDD) and dogs in wheelchairs, Barbra Techel created this day in memory of her beloved Dachshund, Frankie, nationally and internationally known as the ‘Walk ‘N Roll Dog’, and in honor of all wheelchair dogs around the world. Barbara witnessed first-hand from Frankie who became paralyzed after a fall and diagnoses of IVDD, that dogs in wheelchairs can live happy, long, quality lives if given a chance. We should not take pity on pets who may lose their mobility but instead celebrate and embrace their perseverance and adversity. In Frankie’s memory Barbara founded this day to continue to bring positive awareness to all dogs in wheelchairs. The AVDC Service Dog Oral Health Exam program is a philanthropic event provided to the Service Dog public by board certified veterinary dentists of the American Veterinary Dental College. If your Service Dog qualifies, it would receive a complimentary oral health screening exam in June to help identify any problems that may affect the dog’s oral comfort and health. Our veterinary dentists understand the tremendous daily contribution Service Dogs make to the lives of individuals and to all of us as a society. In return, we want assist in these efforts, by assuring that the Service Dogs can have pain free and healthy mouths. 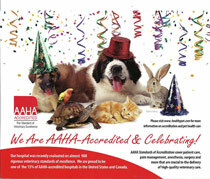 AVDC Service Dog Oral Health Exam will be given by Dr. Carmichael. Click here for more details. 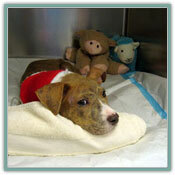 The Veterinary Medical Center of Long Island would like to formally thank the ASPCA for their generous contribution made to help defer the costs associated with the extensive treatments and diagnostics performed to save Joey, the Pit-Bull puppy animal cruelty victim thrown from a car in Brentwood, NY. Their amazing generosity has invaluably provided essential continued care and awareness to this most deserving cause.